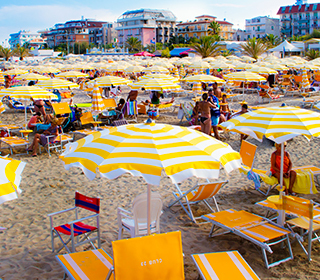 Our hotel is only 50 metres from the beach and very close to San Benedetto del Tronto city centre. We offer a wide range of facilities, exclusively dedicated to families and children’s needs; we boast one of the best equipped beach resorts of the whole Palm Trees Riviera, a restaurant with tasty menus, a rich and varied buffet and genuine typical dishes. “Hotel Giancarlo” is all of it and even more: a welcoming and friendly staff, that will make you feel at home, with all the joy of a holiday! 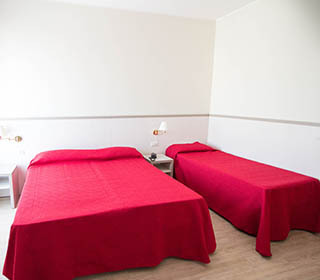 All our rooms are equipped with private bathroom, telephone, led tv, air conditioning, safe-deposit box, mini-bar and hairdryer. Our guests have the possibility to rent bikes to visit our seafront with its bike lane and free wi-fi. Our beach resort is only 50 metres away from the hotel and can be reached easily and quickly on foot also with strollers and beach equipment. “Club 23” is our beach resort: modern, with all kind of facilities. Discover an holiday in the sign of wellness and relax.